Google Inc. maintains an index of Websites and other online content, and makes this information freely available through its search engine to anyone with an Internet connection. The Company’s automated search technology helps people obtain nearly instant access to relevant information from its online index. The Company generates revenue primarily by delivering online advertising. Businesses use its AdWords program to promote their products and services with targeted advertising. In August 2008, the Company sold the search marketing business of Performics, a division of DoubleClick. In September 2008, Google Inc. bought Korea-based blogging software developer Tatter and Company. In September 2009, the Company acquired ReCAPTCHA Inc., a spin-off of Carnegie Mellon University's Computer Science Department. 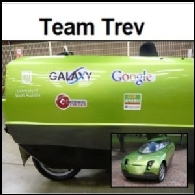 Google Inc. (NASDAQ:GOOG) Australia se ha convertido en el patrocinador de un "Equipo Trev", que se prepara para correr un vehículo único de electricidad de todo el mundo.